A religious vocation is a special grace that God gives to certain persons, calling them to a life of the evangelical counsels. is, therefore, a gift and an opportunity that must be freely responded to if the grace is not to remain sterile and ineffective. We used to speak, and perhaps still do, of promoting religious vocations. Actually, we cannot promote vocations. Either God gives them or they don’t exist. We can only discover what God has given and then foster a vocation that is presumably there. critically important in an age when so many once-promising vocations seem to have been lost. (3) a readiness to give oneself to a life of sacrifice in the footsteps of Jesus Christ. need for recognizing a vocation is so important that everything else is secondary. I believe that if every prospective candidate were to make a private retreat, even for a few days, under a competent priest, it would help immensely. 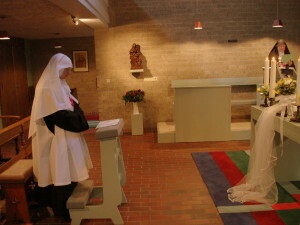 The retreat could be especially geared to a person who thinks that he or she has a vocation to the religious life.